In the previous two lessons, we’ve been talking about WordPress. Lesson #33 covers getting started with WordPress. Lesson #34 covers several of my recommended WordPress settings. And now we’re going cover the fun stuff! One of the great things about WordPress is that you can instantly change the look of your site by changing the theme. -A nice thing about selecting a theme from the WP site, is seeing if it is compatible with the latest version, seeing user comments, etc. -Tip: If you intend to do very much customization to your theme, you might want to choose one that is NOT heavily dependent on graphical design. -Advanced tip: web designers may submit their own theme to WP’s directory (see guidelines first). This could result in exposure from thousands of downloads and back links. -There are also thousands of 3rd party themes for sale and for free. I like to keep a copy of all of my WordPress themes and plugins on my computer, organized in a parallel structure to that on my website. -You could use an AdSense WP Plugin, such as Adsense Manager (search the Plugins directory for AdSense). In general, this would be my recommendation. 1) Choose a theme for your WordPress site and install it. 2) If you’re going to allow comments, activate the Akismet plugin. 3) Explore the other plugins. In the next lesson, we’ll look at how to customize your WordPress theme. As always, you are welcome to post your questions and comments below 🙂 Feel free to let us know your favorite themes and plugins! Eric typically just uses the All in One SEO Pack. I have not seen unless I missed it, any suggestions for Security Plugins, is it necessary for a website/blog that is not open for comments? Most WordPress attacks come through the comments, so it really wouldn’t be as necessary for you. However, I would encourage you to keep comments open in most cases. Comments help foster community, credibility, and trust. WordPress also continually puts out new versions to increase security against such attacks. Another great update for those who need it! I was wondering why you didn’t list XML SiteMaps plugin or 404 Redirect? 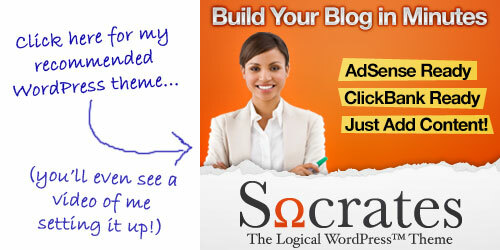 I use all of the above listed themes on all my blogs, I very fond of All In One Seo, it does everything for you. Those can certainly be useful plugins as well. I can see from this lesson that it is getting a bit old, WordPress has moved way beyond this version displayed in the lesson-For instance the themes have exploded and those default themes have not been included for at least 3 years….sound lesson though-maybe an update is in order? Yes, WordPress continually releases new updates, but Eric focuses on keeping lessons “Evergreen” by teaching timeless principles. We’ll definitely see if this lesson merits an update sometime soon! Putting a title in the All In One SEO pack does not change anything. it by editing and scrolling down to All In One Seo and it doesn’t work. Hi Eric, I’m preparing to launch a new site, not sure if I should use single page or mini site or a wordpress design. I’d like to make it a membership site teaching effective traffic strategies that I’ve learned and have worked for me in my own online biz. As for design, I was thinking a page with a video player, archive library of my tutorials would work as well as a way to interact with my visitors. Do you know what wordpress theme might work for me? MY domain will be hosted with GVO. Most themes would allow you to do this. But, the hard part would be to make it a members-only site. You might want to check out “WordPress Wishlist” linked in the above post. your amazing! You know. I know you know. just had to blurt it out again. Thanks so much for the lessons. I am building my blog and when I attempt to download Ajax Comments – Reply it gives this warning: This plugin hasn’t been updated in over 2 years. It may no longer be maintained or supported and may have compatibility issues when used with more recent versions of WordPress. Is there another comparable plugin I can use in it’s place? It hasn’t been removed yet, so it may still work just fine. Please let us know if you have any trouble, and we’ll look for alternatives in the meantime. The third party app precaution about time down is a nice tip. I’ll be aware of uploading too much plugins on my WordPress website. Hello I had trouble getting the API number for the Akismet plug in doesn’t matter how I try WordPress wants to charge me $96 I thought it was free. I followed your direction by going to WordPress.com but it wants to charge me?